Trump Urges Republicans to Fight Pennsylvania's Congressional Map - Integration Through Media ....! (VOA): President Donald Trump on Tuesday encouraged Republicans to fight Pennsylvania's new court-imposed map of congressional districts, issued a day earlier in a move expected to improve Democrats' chances at chipping away at the GOP's U.S. House majority. “Trump tweeted that Republicans should challenge the new map of Pennsylvania's 18 congressional districts all the way to the U.S. Supreme Court, if necessary. “Your Original was correct! Don't let the Dems take elections away from you so that they can raise taxes & waste money!” Trump tweeted. Republicans have already vowed to challenge it in federal court, as early as Tuesday. The Democratic-majority state Supreme Court met its own deadline Monday to issue the new boundaries after it threw out a 6-year-old GOP-drawn map as unconstitutionally gerrymandered. The Republican-controlled Legislature and Democratic Gov. 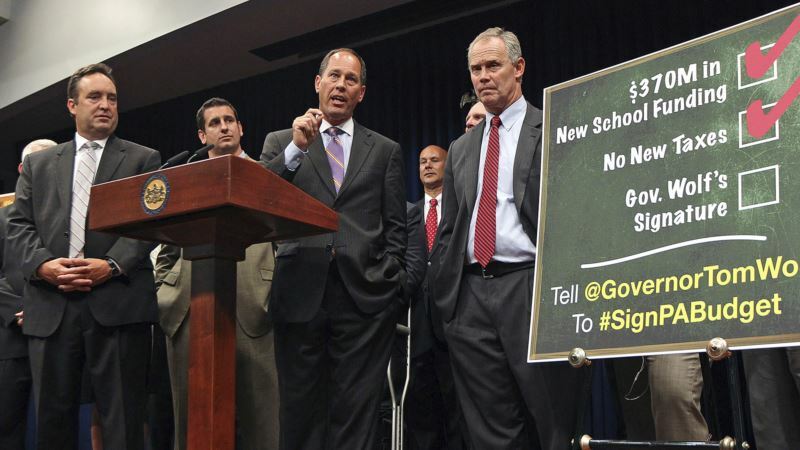 Tom Wolf did not produce a consensus replacement map in the three weeks allotted by the court. The new map is to be in effect for the May 15 primary and substantially overhauls a Republican-drawn congressional map widely viewed as among the nation's most gerrymandered. New boundaries will likely usher in changes to Pennsylvania's predominantly Republican delegation, which has provided a crucial pillar of support for GOP control of the U.S. House. Most significantly, the new map gives Democrats a better shot at winning a couple more seats, particularly in Philadelphia's heavily populated and moderate suburbs. There, Republicans have held seats in bizarrely contorted districts, including one described as “Goofy Kicking Donald Duck.” Republican Rep. Ryan Costello, whose suburban Philadelphia district was narrowly won by Democrat Hillary Clinton in 2016, is in even more dire straits now that his district adds the heavily Democratic city of Reading. The state's delegation is already facing big changes in a year with six open seats, the most in decades. Meanwhile, candidates finding themselves in a new political landscape are rethinking campaigns a week before they can start circulating petitions to run. The map removes the heart of one district from Philadelphia, where a crowd of candidates had assembled to replace the retiring Democratic Rep. Bob Brady, and moves it to suburban Montgomery County. The new map does not apply to the March 13 special congressional election in southwestern Pennsylvania's 18th District to fill the remaining 10 months in the term of former Republican Rep. Tim Murphy, who resigned amid a scandal. But it renders the special election virtually meaningless: the court's map puts each candidate's homes in a district with a Pittsburgh-area incumbent. The court ruled last month that Republicans who redrew district boundaries in 2011 unconstitutionally put partisan interests above neutral line-drawing criteria. It was the first time any state court threw out congressional boundaries in a partisan gerrymandering case, this one brought by registered Democratic voters and the League of Women Voters last June. The new map repackages districts that had been stretched nearly halfway across Pennsylvania and reunifies Democratic-heavy cities that had been split by Republican map drawers six years ago. Democrats cheered the new map, while Republicans blasted it. Independent analysts said the map should improve Democratic prospects while still favoring Republicans as a whole. An analysis conducted through PlanScore.org concluded the court's redrawn map eliminates “much of the partisan skew” favoring Republicans on the old Republican-drawn map, although not all of it. University of Florida political science doctoral student Brian Amos said Clinton beat Republican Donald Trump in eight of 18 districts in the 2016 presidential election on the court's map. That compared with six of 18 districts Clinton won in 2016 under the invalidated map. Republicans who controlled the Legislature and the governor's office after the 2010 census crafted the now-invalidated map to elect Republicans and succeeded in that aim: Republicans won 13 of 18 seats in three straight elections even though Pennsylvania's registered Democratic voters outnumber Republicans. Republicans will argue in federal court that legislatures and governors, not courts, have the constitutional responsibility to draw congressional maps. But they appear to face an uphill battle since federal courts are normally reluctant to undo a state court decision, said Michael Morley, a constitutional law professor at Barry University in Florida. “I think it will be a major obstacle and a major challenge to get around it” Morley said.